Flightseeing departures out of Skagway are straight forward. The airport, ferry port and train station are all within walking distance. 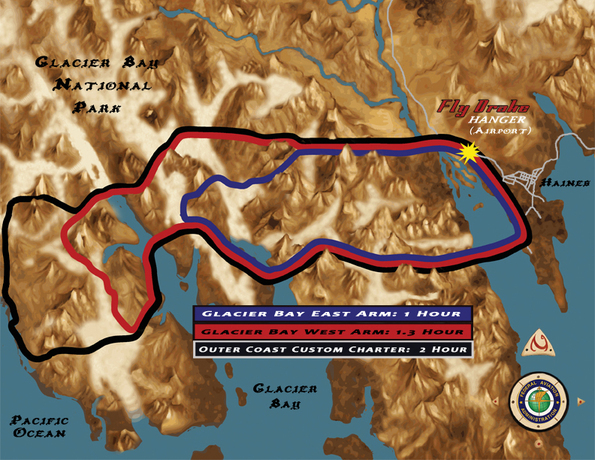 Contact me to set up a departure out of Skagway and we will escape to glacier flightseeing country within minutes. 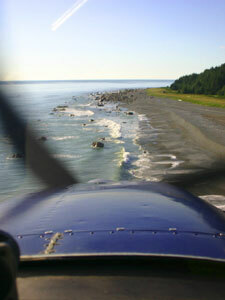 Haines Airport is just three miles from the town of Haines Alaska. If you arrive via ferry form Skagway or another port town. I can shuttle you to the airport for a flight in one of Fly Drakes Cessna Alaskan Bush planes. From the airport we are on the door step of Glacier Bay National park. A glacier or beach landing are always an option weather permitting so please just ask if you would like to try and plan one. what a cutie! Got the DVD 'Deeper', our knuckle draggers are gonna go nuts! We will be in touch, as we plan our Alaska trip, and will seek your transport assistance...!